Made in Holland by De Ruyter. Known in Holland as Vruchtenhagel. 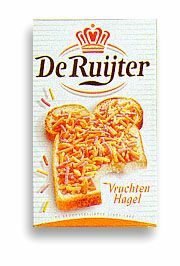 The Dutch eat this on a buttered slice of bread or toast, but they are also great for cake or icecream toppers.